i’m not alone any more. i’m part of a band! survivor girl ukulele band project 2016 — back to kolkata!!! is well underway!! but before i get to 2016, please give a listen to some recordings from sgub 2015! sgub gave eight performances in kolkata!!! this was a huge achievement for everyone! for me, for sanlaap india’s shelter home staff — who partnered so beautifully with sgub every step of the way, for the girls, who practiced, and prepared, and performed in front of enthusiastic audiences, and for the many around the world who support survivor girl ukulele band!! this first recording is of twenty-two girls on stage at the american center in kolkata. my friend julie schofield, a fulbright-nehru student researcher, invited sgub to perform at her event, “creating possibilities: empowering through the arts.” the sgub girls delivered a program of eleven songs!! they were the hit of the evening, and yep!! they felt empowered through the arts!! “what was the best part of the program,” i asked the girls the day after. “survivor girl ukulele band song!” saheli* said. so give a listen to twenty-two girls at the american center in kolkata singing the “survivor girl ukulele band” song, written by ed tree. survivor girl ukulele band on their way to a gig. entering the hall for the very first performance of survivor girl ukulele band!! one of the first songs the girls learn to play on the ukulele is “twinkle twinkle little star.” they already know the words and the melody, so it’s a great way to show them how to find the notes and listen as they play. the girls play “twinkle twinkle little star” so many times, i thought it would be fun to change it up and bring it into a minor key. sanya* was the first survivor girl to make the song her own. this performance was for indrani sinha, founder of sanlaap, who stopped by in early july 2015 to hear the girls play and to invite me and survivor girl ukulele band project to return to sanlaap in 2016.
this next photo was taken at a performance on 9 june, 2015 at the west bengal state child protection day. this photo doesn’t show that the balcony was packed! survivor girl ukulele band was added at the very end of a three hour program. many in the audience had gone by the time the girls performed. but what this photo doesn’t show is that the balcony was packed. and as the girls took their bows, they got a standing ovation from the entire balcony!!! wow!! walking off the stage to a standing ovation — their feet are barely touching the floor!! by the time i was about ready to leave india and head back to the usa, survivor girl ukulele band had performed four times. the girls were having such a great time with rehearsals, getting all dressed up for the show. i asked rajni* how survivor girl ukulele band had impacted her life. thank you thank you thank you everyone who supports sgub. i hope you feel great about what sgub is doing in the lives of these survivor girls. you are an important part of the band! shortly before i left india for the usa, sanlaap celebrated its 30 year anniversary!! priyanka handed me her ipad, and i snapped this shot of the staff at sanlaap’s 30th anniversary party. a few short weeks after this party, we lost our dear indrani sinha, founder of sanlaap. she died of a heart attack in bangalore. indrani was a major force in the world-wide fight against human trafficking, and the loving and generous and wise guiding light to all of us at sanlaap. in memoriam. indrani sinha, 15 march 1950 – 22 august 2015.
i am intelligent. i am brave. i can do this. faces are not shown for privacy and security. you may remember my post about latika*, the girl who got discouraged and hid behind her ukulele because she didn’t think she could retain anything she had learned and wanted to quit. many of my students, like latika, have very little education and don’t have much confidence about learning. they’re only girls, they are poor. they have been neglected and abused. their experience has told them they are worthless. they are good for only one thing. these are the negative messages they have heard their whole lives. i felt it was high time they start telling themselves some new things. some good things. so i went online and got a few phrases translated into bengali and printed them out and inserted the sheet at the back of their music books. the next day we opened the books to the back page, and i gave a few instructions. “ami buddhiman hoi!” i said. the others repeated: “ami buddhiman hoi!” — i am intelligent. they giggled a little at such a statement. “ami shahoshi hoi! …. ami shahoshi hoi!” — i am brave. they weren’t expecting this statement either, but they liked it. “ami eta korte paree…. ami eta korta paree!” — I can do this! now they were having fun. “prabhu amake shahajo karun! amen…..prabhu amake shahajo karun! amen.” — lord, please help me! amen. there was a charge, a new energy, in the room. just saying those words, out loud, together. then we said them all over again in english. and then we took one minute of silence to meditate on those words. and in the silence they settled down and were ready to learn. i wondered, would this new way to start the class work? was it helpful? was it meaningful? the next day, the girls sat on the floor ready for class. and the first thing they did was open their music books to the last page. they were ready to say those good things to themselves again. and they said them with gusto. the next weeks when i walked by their building someone often yelled: “laurie auntie!! ami buddhiman hoi!! ami shahoshi hoi!” from their window. hurrah! some days after we started the opening meditation, a dental team led by dr bob zimmerman from the usa deposited stacks of big gray plastic trunks in the building where i live. the next morning they came back, unpacked the trunks, and within a short time, had transformed the room into a working dental suite that included six colorful beach chairs fastened on top of the gray trunks. three dentists, their assistants, and a cadre of other helpers were ready for patients. they were like a dental swat team. i heard loud crying and wailing outside my door. i was in my room getting ready to teach my morning ukulele class, when i heard loud crying and wailing outside my door. “that sounds like sanya*,” i thought to myself, and quickly went out to see what was going on. there was sanya, in the beach/dentist chair, scared and crying and refusing treatment. she was surrounded by people trying to calm her down and convince her to get treatment, but she wasn’t having any. she jumped off the chair and scooted outside. i followed her and gave her a hug. she was shaking. she clung to me. and all the girls who were waiting for treatment were wide-eyed with alarm. never in my life did i think i would be using my in my meager bengali/hindi mix to convince these girls to get dental treatment, but that’s what happened. in the few words i knew, i told sanya that those people were my friends and they were good people. and then we repeated “ami shahoshi hoi. ami eta korta paree. prabhu amake shahajo karun.” — i am brave. i can do this. lord please help me. and then i got out a ukulele and we started singing together. for a while sanya continued to cling to me. she could have left. but she didn’t. and after a while she got back in line for treatment, dragging me with her. she went back inside and got her treatment, and i held her hand. i held a lot of hands that week. and sometimes they really crushed my hand. with a few phrases and a few songs i was able to convince a number of girls who had jumped out of the chair to go back and get treatment. and i held their hands too. thank you, amazing dental team, for the great work you did at sanlaap. thank you for allowing me to participate on the fringe of your project. and thank you thank you thank you, everyone back home for your love and support in survivor girl ukulele band project. it was a privilege to hold those hands, and i wouldn’t have been able to do it without you. 13 april 2014 — four months to the day after i first started teaching at odanadi seva trust in mysore — survivor girl ukulele band went public with a mashup of a well known bollywood favorite, “kuch kuch hota hai” and justin bieber’s “baby”!!! it was a bit rough around the edges and only a few girls performed, but it was a lot of fun and a big milestone for survivor girl ukulele band project. hurrah!!! not to be outdone, the boys of odanadi wanted to learn the song too, so here’s an audio recording of that same “kuch kuch hota hai / baby” mashup. if you have one minute — this is not to be missed!! the bieb goes on!! pinkie loves to sing and play! it’s the hot season here now, and schools are taking their summer break. some odanadi residents have gone home for a few weeks, while some of the college girls who have been too busy with their college courses to learn ukulele are now joining my classes. and there are some new little ones who want to play too!! she won’t be coming back to odanadi, and i have been thinking about her and missing her, but — good news! miriam called me today: she is doing great and is happy and wants another lesson on 12-bar blues. yay!!! papu* has gone home for the summer, but his father lives a few miles away from the odanadi girls’ home, so he comes to the girls’ home for ukulele lessons. papu said that his father asked him, “where did you learn to play ukulele?” and he said, “a foreigner came and taught me.” and now he is teaching his father and his uncle how to play, too. last month i started a gofundme campaign to raise the necessary funds for the last months of my time here in india before i head back to the usa in june. thanks to many generous donors, my financial needs have been met. i am so blessed to have the love and prayers and financial support of so many in this wild project called survivor girl ukulele band. thank you thank you thank you!! shops in pune have been closed for a week due to a bandh, or strike, by merchants against a new tax. this made it difficult to purchase prizes for the friday contests in the survivor girl ukulele band project. but thursday afternoon i found a little shop that sells bangles, bindis — those little decorative dots that indian women put between their eyebrows, and mehndi — known back home as henna. a faded, dusty, and exotic looking old bedcover shielded the little stall from the afternoon sun, and inside the closet-sized shop the walls were lined with colorful bangles. hanging from the pole in the middle were dusty strips of cellophane sleeves that held packets of bindi that caught my eye. “kitna hai?” i asked, pointing to the bindi. the next day i displayed the bindi and mehndi on the floor for my beginner ukulele class’s tuning contest. the girls’ enthusiasm rose a few notches. “whoever tunes their ukulele the best will get to choose their prize between the bindis and the mehndi,” i said. “and next week’s contest will include fingernail polish!” as this was being translated, the girls grabbed their ukuleles and their pitch-pipes and scampered off to find a quiet space in which to concentrate. i’ve never seen them so interested in tuning. and here’s me with three of my first batch advanced beginners. these girls rock!! here’s where i teach. it’s called the terrace, and it’s the covered roof of the home. 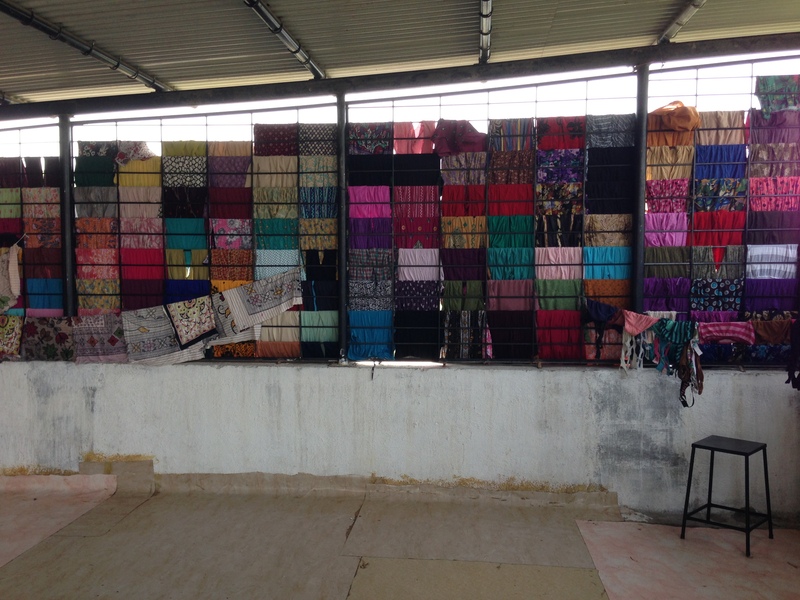 every day the girls’ clothes are hung to dry on the north wall of bars that surround the terrace. it makes for a pretty place with decent acoustics in which to teach. the fellow below was also very interested in the uke that i often carry around in my backpack. we met on a number of occasions at this little chai shop down the street from the guest house where i stayed when i first arrived in pune. the first day we met he asked, “you are from nigeria?” i didn’t quite know how to answer that. after i took this video on my iphone 3gs he said, “tell me again, how much does that phone cost?” i told him that phones like this are a couple of hundred dollars and then about $100 a month on a two year contract. the small crowd that had gathered calculated the cost of an iphone in rupees, and their eyes widened. he liked my uke, but really really really liked my iphone. i get that lot. we are just four days into survivor girl ukulele band lessons, and it is amazing to see what the girls are accomplishing. last friday when i visited the protective home for girls who have been rescued from brothels, they sang me a song — tu pyaar ka saagar, your love is like the sea. so i got a guitar hero to figure out the chords for me and was able to start teaching them to play the song with just a few chords, c, g, and a minor. on day one, i started with three girls each in two separate classes. in each class one of the three girls spoke english. someone advised me to limit the classes to a half hour each, because the girls would be unable to be attentive for more than that. monday’s first class went for an hour and forty-five minutes, and they were tuned in every minute. on day two i combined the two classes, and now have six girls in the class. here’s a video from day two, where the girls are practicing moving from the c chord to the g chord. on day four, one of the girls showed up late, and didn’t want to tune her ukulele because she felt she couldn’t do it. she was also struggling with a stiff strum hand. i took her aside and helped her “dekho aur suno” — hindi for “look and listen” — as we looked at the electronic tuner and at the same time listened to a pitch pipe and the sound of each string as we found the correct tuning. then i tried to get her to relax her strumming hand, but she couldn’t do it. so i had her take ahold of my strumming hand. when we started to play, she wanted to take over and control my hand, but after a minute she was able to relax and let her hand move along with mine. still, it didn’t immediately translate into an easy strum on her own. can you believe it? this is just her fourth day of playing ukulele! our survivor girl ukulele band project is nearly underway. i say “our” because i’m not doing this all on my own. many people are part of this endeavor, and i’m grateful for each and every one of you!! here’s the low-down on week one in india. after 22 hours of air travel, i was glad to have friends in navi mumbai who had invited me to stay with them. and they didn’t seem to mind that i arrived at 2:30 am, in fact they rustled up some food and we talked for hours. here’s a photo of the guesthouse telephone. you don’t see too many of these classics around anymore. i will be working in the ngo’s smallest home, which houses forty girls. it is super exciting to think about growing this project to 400 girls. i’m quite sure that some of the first girls will be able to teach others, and so on, until the only limitation will be the number of ukuleles available — and my own skill on the ukulele. i just hope i can stay one step ahead of those girls! below is a video of what i had for dinner last night. masala dosa on the street. i’m experimenting with video, so please let me know what you think.